Partnering with the Albany Center of Excellence in Nanoelectronics "will significantly enhance our internal development efforts, ultimately allowing us to shorten the time required to bring critical technology from the research lab to the production floor," Tokyo Electron President and Chief Executive Tetsuro Higashi (pictured) said at the project announcement in Albany. Tokyo Electron Plugging $300M R&D Center into Albany, N.Y.
"Without Sematech, I don't know whether or not this would have happened," Gov. 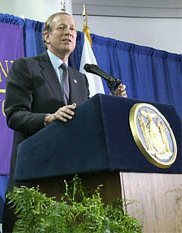 George Pataki (R) said in announcing the project in the rotunda of Albany State University of New York's (www.albany.edu) Center for Environmental Science and Technology Management. The announcement was delivered at the same site at which Sematech's northward expansion was unveiled five months earlier. "Without Sematech, I don't know whether or not this would have happened," said Pataki (pictured at podium), who announced the Tokyo Electron expansion at the same site where Sematech's northward expansion was unveiled five months earlier. "Sematech had a huge impact on Tokyo Electron and other companies taking a very serious look at what we're doing here in upstate," Pataki said of the anticipated spin-off tsunami. Tokyo Electron, a Sematech supplier, will hire 300 highly paid employees for its Albany operation; workers' annual salaries will average around $100,000, Tokyo Electron officials said. The Albany facility is the first R&D center that Tokyo Electron has located outside of Japan. Japanese sites were considered for the expansion, Tokyo Electron officials said. But Albany's final short-list competitors had narrowed down to two U.S. locations: Austin - also home to Tokyo Electron's North American headquarters - and an undisclosed location in California's Silicon Valley. The Albany site's selection could also have further location ramifications: The R&D project could possibly prompt Tokyo Electron to position some of its manufacturing plants in the Capital Region, state officials said. The Tokyo Electron project's announcement appropriately coincided with the groundbreaking for a $200-million, 220,000-sq.-ft. (20,438-sq.-m.) facility at the Albany Center of Excellence in Nanoelectronics (www.albanynanotech.org). The new building will house a 300-mm.-wafer R&D, incubator and work-force training center - the only 300-mm. (12-inch) operation currently located on a university campus. That groundbreaking underscored another major location factor for Tokyo Electron, whose products are used in many chip-making processes, including circuit etching and wafer cleaning. Locating in the Albany Nanoelectronics Center will accelerate its development of products for next-generation wafer fabrication. "By participating in this center, we will significantly enhance our internal development efforts, ultimately allowing us to shorten the time required to bring critical technology from the research lab to the production floor," Tokyo Electron President and Chief Executive Tetsuro Higashi said in Albany. "I was extremely impressed with the potential of this facility." Cost efficiencies were also part of the Nanoelectronics Center's appeal. When the center's 300-mm. facility is completed (adjoining an existing 200-mm. facility), it will house a fully integrated line for next-generation chip fabrication - including two 300-mm. clean rooms. That, in turn, will allow Tokyo Electron to cost-effectively road test its product prototypes in a state-of-the-art environment. One major location factor for Tokyo Electron was the 300-mm. facility now under construction at the Albany Nanoelectronics Center (pictured at the center of the artist's rendering above). The 300-mm. operation will be flanked on the right by an existing 200-mm.-wafer facility, and on the left by an incubator and "technology accelerator." The Albany location also means considerable financial assistance for Tokyo Electron. The company is committed to only $100 million of the estimated $300 million in total capital expenditures involved in setting up its Albany R&D center. The state has committed to provide $100 million for Tokyo Electron's project. That $100 million will be invested primarily in capital construction, equipment and specialized research tools, state officials said. New York provided $210 million in state assistance for the Sematech project. Another $100 million for Tokyo Electron's project will come from undisclosed partners with the Albany Center of Excellence in Nanoelectronics, according to university officials. More than 100 corporations are currently partnering with the Nanoelectronics Center in chip design, including advanced device fabricators, primary equipment suppliers, component suppliers, and material or chemical suppliers. Landing the Tokyo Electron's first non-Japanese R&D center may be even more significant for the area than Sematech, some observers contended. "Believe me, this will send global ripples throughout the semiconductor world and the high-tech world," Pataki said. "This is a huge step toward making Albany and upstate New York truly the high-tech center of the 21st century." The sizable project is also a huge step for Tokyo Electron, given the chip industry's sharp slump. The company, though, sees the downturn as an ideal investment window. 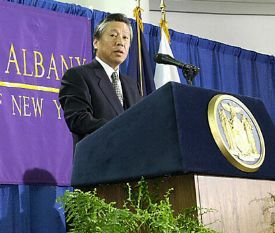 The Albany project, Higashi said, will solidly position Tokyo Electron to snare market share when the semiconductor industry rebounds. The project could also position the Capital Region for further high-tech growth - at least if Tokyo Electron decides to locate some of its manufacturing operations in the area. "We are actively working on the next phase, which is to bring manufacturing jobs to upstate New York as well," Pataki said. The state has reportedly offered the company a $50-million incentive package if Tokyo Electron moves all of its U.S. manufacturing operations to Albany. The company's current U.S. plants are located in Austin; Beverly, Mass. ; and Gilbert, Ariz.
"As a rule, the manufacturing facilities are located within a reasonable proximity of the R&D facilities," Pataki noted. State officials, however, declined to comment on the incentive offer, preferring instead to bask in the area's latest high-tech coup. "I had no doubt that when we announced Sematech, there'd be days like this," said Pataki. "There will be more." Looking for a previous Blockbuster Deal? Check the Archive. bd1202bbd1202b ©2002 Conway Data, Inc. All rights reserved. Data is from many sources and is not warranted to be accurate or current.